We checked out of the Elizabeth Street Inn in Newport and made our way up the Yaquina Bay Road towards Toledo. Thanks to the prodding of an as of yet only marginally caffeinated Roy, we stopped at the Oregon Oyster Farms for an unplanned and unannounced visit. And owner Xin Liu (call him Lou) couldn’t have been happier to see us. 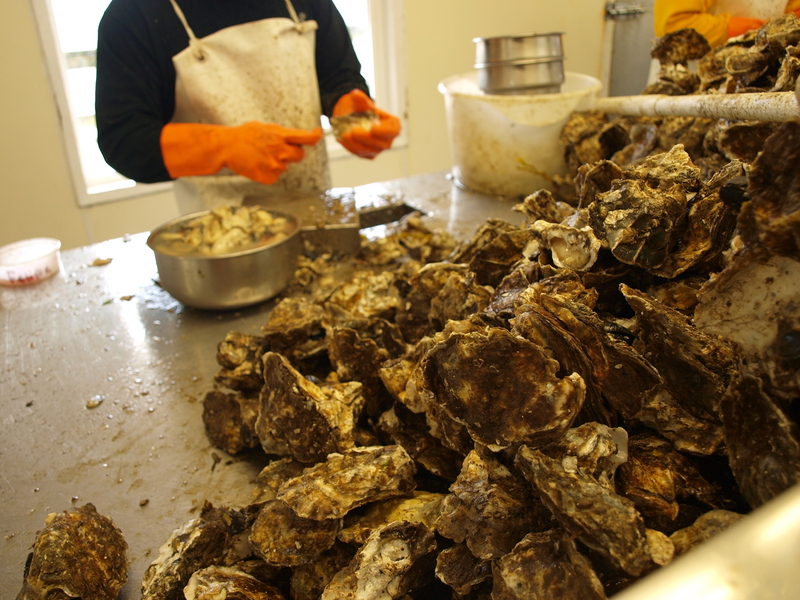 He gave us a tour of the facility and we witnessed some Olympic level oyster shucking. He even sent us on our way with a tub of smoked oysters for our trouble. If the opportunity ever presents itself, I recommend traveling the Oregon Coast with Lucy Gibson sometime and see what kind of doors swing open. We got back on the road and made our way to what was the official first stop of the day at SolaLuna Studios, an art gallery in Toledo. 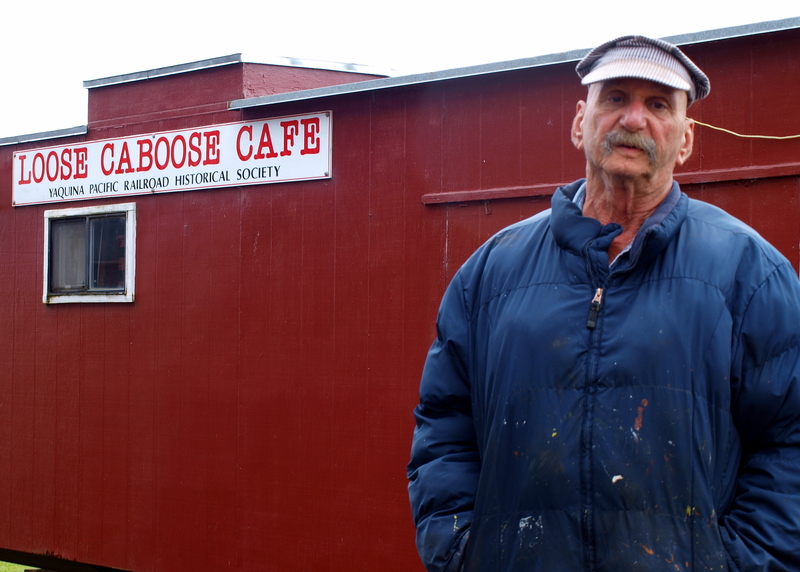 We were met by owners and artists, Sarah Gayle and Wayne Plourde. 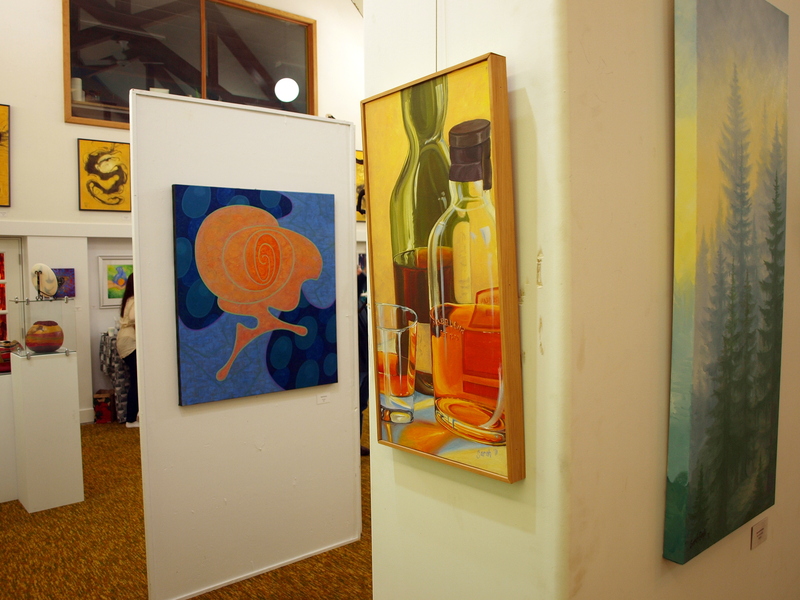 We were also met by a group of local artists whose work was currently on display in the gallery. This was a real treat. Not only were we allowed to browse the gallery and chat with the actual artists, they made us a pot luck style brunch to enjoy while we perused some of the finest art the Central Coast has to offer. I don’t know who was responsible for it, but if art doesn’t work out for whoever made than green chile breakfast bake, keep your mind open to a café of some sort. We spent a good amount of time here as the art and the hospitality were very conducive to a relaxed and enjoyable visit. Plus Wayne’s visiting daughter was enchanting (sorry Wayne). We eventually said our goodbyes and were lead to the Yaquina Pacific Railroad Historical Society. We were greeted by a mix of staff and volunteers that where as passionate as they where knowledgeable about the history of the railroad. One volunteer in particular, Leonard, looked as though he was born to disseminate tales of the trains. The YPRHS is housed in a couple of old train cars and was remarkably interesting and informative. The interpretive displays contained historic artifacts and photos that were only complimented by the factoids and stories provided by the staff. It’s places like this that fascinate me. They constantly struggle for funding despite their historical, educational, and cultural importance. I would encourage you to visit. After lunch our time in Toledo had come to an end. 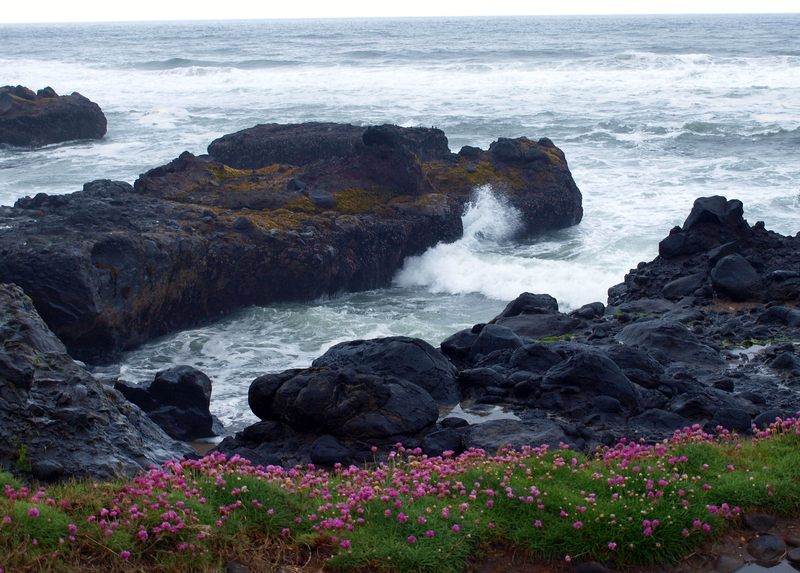 We headed down the coast again to the small town of Yachats. This is where things get luxurious. We checked into the Overleaf Lodge and Spa. Sounds like a place you would want to stay, right? Well it is! Click on that hyperlink and take a look. Missed it the first time? Here it is again. The Lodge was beautiful, adorned with magnificent, one of a kind pieces of art. The Spa was as soothing and peaceful as any I have had the privilege of stepping into. But the stretch of beach that the Overleaf cozies up against is quite literally breathtaking. When we got there, the weather wasn’t exactly lending itself to photography, so what I got was painful considering just how good it was. And there are hiking paths! The historic 804 Trail runs right between the property and the beach. And my room had a whirlpool tub! And it was right on the beach, well they all are as it turns out, but I was in one of them! I actually didn’t want to leave, but eventually it was dinner time and in hindsight I’m glad I made the trek. We went to the Drift Inn Family Restaurant and Pub. The place had great live music that was at the perfect volume level to still have dinner conversation. We chose entrees from one of the furthest reaching, eclectic menus I can recall having placed in front of me. Normally when a place does that I’m scared. But they pulled it off. We all had very different meals and all of them turned out great. How do I know? I sampled from everybody’s plate. This was day 4 and we were family now. 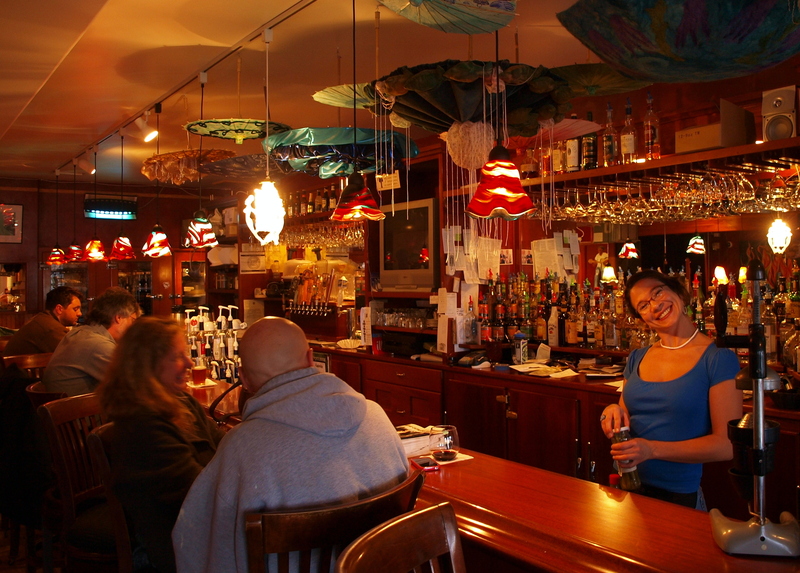 The Drift Inn also boasts one of the most charismatic, camera aware barkeeps alive. Check her out. I was lining up a shot at the bar and I swear she was going about her business and not paying me a lick of attention. Then a split second before the shutter clicks – there she is. Head perfectly tilted with a killer smile. Well played Madame. We left the Drift Inn stuffed to the gills and retired to our rooms at the Overleaf. It was time for some wine and whirlpool tub action for yours truly. Check out the next day would be at 8:30. 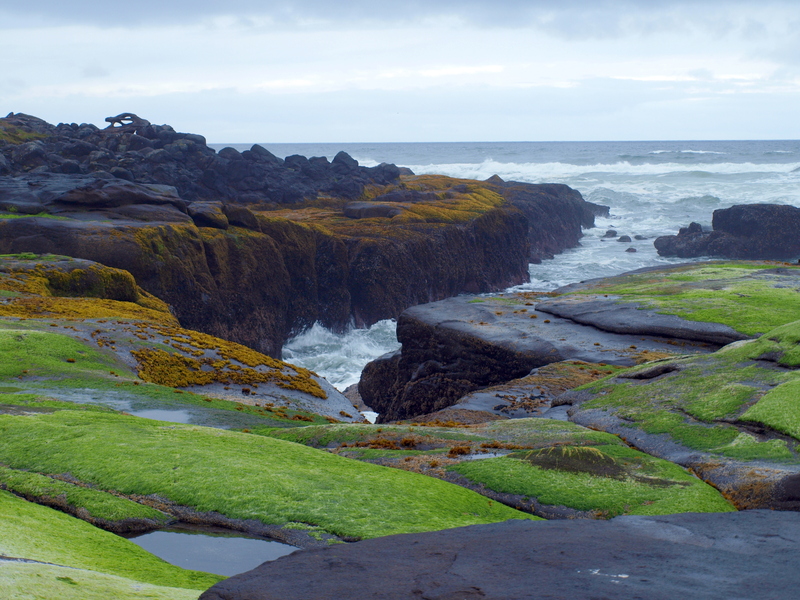 Exploring the eerie early morning beauty of the coast in Yachats, Oregon. Taken from the historic 804 Trail that runs beside the Overleaf Lodge.